Made up of citizen volunteers appointed by the Mayor and City Council, the Committee for the Arts (CFTA) was established by City ordinance in 2000 to promote and celebrate Gloucester’s cultural heritage and to foster an appreciation of arts and artists in the local community. The Committee works to preserve and increase awareness of Gloucester’s WPA-era murals and other City-owned art. Additionally, the Committee develops and promotes educational programs and establishes awards and honors to recognize local artists. 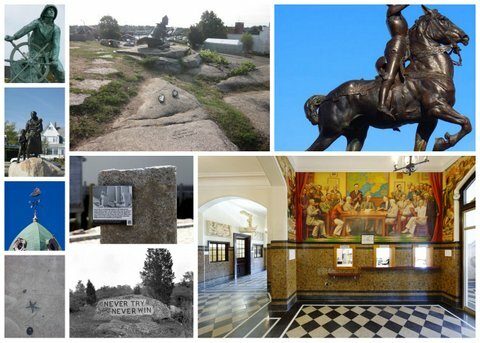 The committee works with other City departments to shape and implement City-wide public art policy. The Committee advises City officials on the value of a diverse, cultural life as well as encourages art programs within public schools. 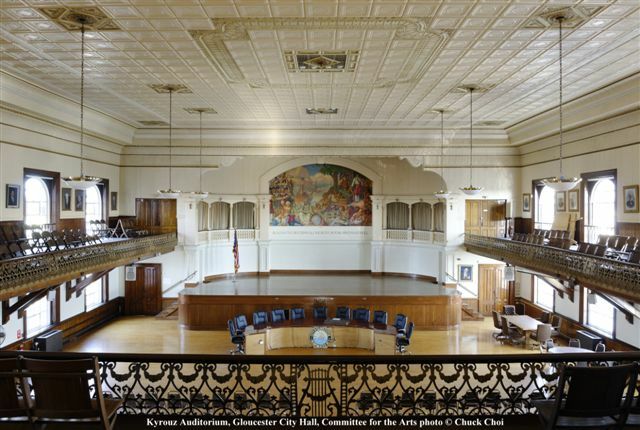 Year round, when City Hall and the library are open, make time to see examples of Gloucester's beautifully painted and detailed WPA-era murals. We are fortunate to have such holdings and we are committed to preserving this part of Gloucester's history. The CFTA is grateful that the City of Gloucester continues to invest in our City’s arts and culture. Some of the murals were restored in 2014. Before any restoration work could begin, the CFTA secured strategic funding over a period of several years via grants and with the generosity of individuals and foundations including: the Belinda Foundation at the Boston Foundation, seARTS with the Massachusetts Cultural Council, the City of Gloucester CPA funding, and the Bruce J. Anderson Foundation. Thank you for this support! 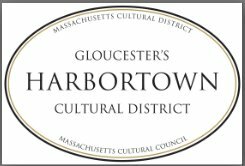 The City of Gloucester Committee for the Arts establishes awards and honors to recognize local artists including the position of the City of Gloucester Poet Laureate. The Poet Laureate is dedicated to building community through poetry and encouraging a love of poetry among people of all ages. Many fine poets live and write in the city of Gloucester and their poems have been widely published. 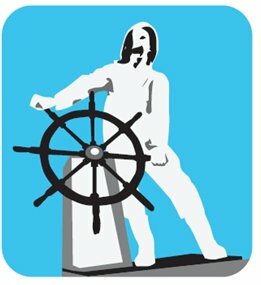 The honorary post for the City of Gloucester was created in 1998. There have been 4 Poet Laureates. Vincent Ferrini was the first Poet Laureate (1998). Gloucester's former Poet Laureates: Peter Todd served 2014-2015 and Ruthanne Collinson served July 2010-2014. John Ronan preceded Ms. Collinson as Poet Laureate and served 2008-2010, maintaining the website resource dedicated to Gloucester poets, Gloucester Poet Laureate, also for Salt and Light: An Anthology of Gloucester Poetry, published spring 2010. He is the host of the Cape Ann TV program The Writer’s Block. Poems written by the Poet Laureate with other Gloucester poets are found here http://gloucesterpoetlaureate.org/ a website available thanks to John Ronan's unflagging devotion to poetry and Gloucester. There is annual youth outreach for poetry-- the Poet Laureate participates in Gloucester Lyceum and Sawyer Free's Poetry Without Paper Competition and during the month of May participates in Gloucester Education Foundation City-Wide Arts Festival. Carry a Poem! Share a Poem! Look for the annual National Poem in Pocket Day each April. April 10, 2015 Gloucester Daily Times: OUR VIEW column by Gloucester's current Poet Laureate, Peter Todd, and former Poet Laureates Ruthanne Collinson and John Ronan. Please be sure to make the check out to 'the Gloucester Fund' and to put "Committee for the Arts" on the memo line of the check. The Gloucester High School Civil War era coat given to Albert Bacheler is on its way through conservation and new mount and display! As of March 2017 nearly $14,000 that was needed to repair and display the coat was raised. We are grateful for the donations and support from Awesome Gloucester, The Gathering, and MA SHRAB. It would not have happened without the wonderful media coverage it received in Good Morning Gloucester, Cape Ann Beacon, Bay State Banner, and the Gloucester Daily Times. One can still experience FISH NET, an award-winning, site-specific temporary work of art by James Owen Calderwood, one of three artists for the "2013 HarborWalk Public Art Challenge". These awards reflect discussions, community development, planning, and prescient determination to remember and work towards incorporating the creative arts broadly alongside other city efforts. 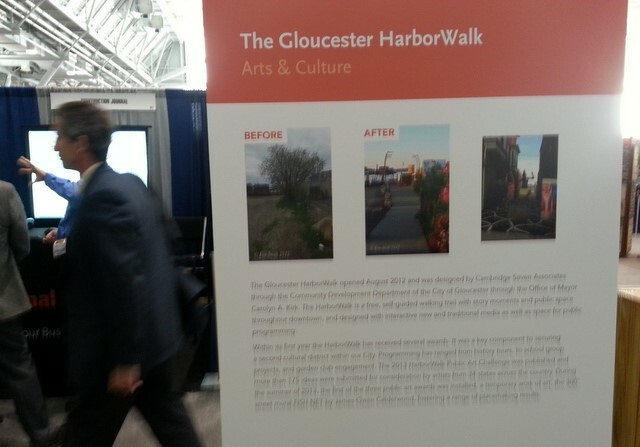 For information about the HarborWalk, visit http://www.ghwalk.org. Calderwood's nearly 300' mural covers Parsons Street (between Main Street and Rogers) and is open daily, self guided. "Leaping" photograph © Cruz Ferraras. Send us your photos! 2014: Justin Desilva's temporary art installation: With Every Street There's a Story, 2013-14, 20 unique, mixed-media murals utilizing downtown Gloucester's pedestrian crosswalks as its canvas. Justin's crosswalks were one of three new works of art commissioned by the CFTA on behalf of the City of Gloucester for the 2013 HarborWalk Public Art Challenge, with funding from the Seaport Advisory Council, and Commonwealth of Massachusetts. Click for Google map record of Justin Desilva crosswalk locations. 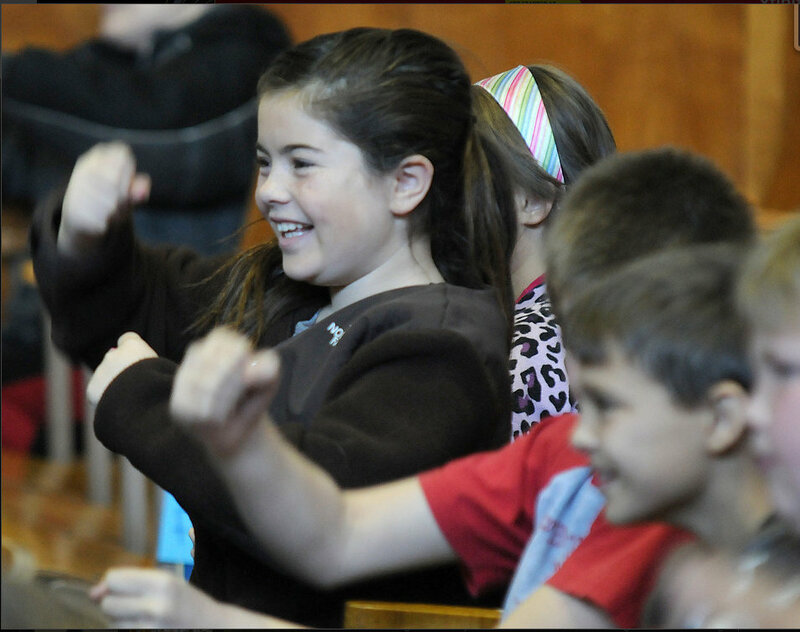 Photo taken April 6, 2012 shows an example of youth outreach via the Poet Laureate: This Gloucester Daily Times photograph captures the excitement of a poetry program at East Gloucester Elementary School that featured Gloucester Poet Laureate Ruthanne Collinson along with Young Audiences of Massachusetts performer David Zucker and Gloucester author/artist Pat Lowery Collins for a dazzling celebration of poetry. Children were also reminded to write or find a poem to bring and share on National Poem in Your Pocket Day. The program was supported in part by a grant from the Gloucester Cultural Council, a local agency which is supported by the stage agemcy Massachusetts Cultural Council, and on behalf of the City of Gloucester, the Committee for the Arts, and the PTO. Ms. Collinson attended West Parish. Minutes are available once approved by the CFTA. The Committee has up to 7 members, each serving a 4-year term.